Our commitment is to healthy and vibrant food & community. We work with local farmers and purveyors to bring you the freshest flavors and wholesome ingredients at every meal. Hotel Washington collaborates with Folk Tree Farm and Hoot Blossom Farm to plan the varieties of crops featured on the menu, providing a true farm-to-fork experience. Our goals are to produce ecological diversity, improve soil quality, and support local farmers, while growing the freshest and healthiest food possible for the hotel each week. In late fall, the chef and farmers meet to plan a menu based on the seasonality of vegetables, herbs, and fruit. Over winter, the farmers order seed and make planting plans. In spring, their plans begin to come to life with greenhouse seedlings which are transplanted to the garden after the last hard frost. Transformed by healthy soil, sunlight, and rain, seedlings grow and flourish. Finally, when each crop is ripe and ready, it is harvested and delivered to the hotel for the chef to prepare fresh salads, roasted veggies, and other seasonal delights. In 2016, Hotel owner Jeannie Kokes invited Russell and Alessandra Rolffs to the Island to grow vegetables for the Hotel Washington for one summer. After their first season, Russell and Alessandra were hooked on the Island life— the starry nights, the paddleboard sessions at Schoolhouse Beach, the lively community— and so they decided to make the Island their permanent address. Hoot Blossom is located on the northern side of the Island and collaborates with the Hotel and Folk Tree Farm to provide the freshest, organic vegetables, herbs and flowers for the hotel. Russell and Alessandra also co-founded Gathering Ground, a nonprofit on the Island dedicated to education and community around sustainable agriculture. In 2017, Gathering Ground started a farmers market that now hosts local farmers, crafters, bakers, and artisans. Located at the heart of Washington Island, Folk Tree Farm was started by Shawn and Casey in 2018 as a farm where they could raise goats, chickens, vegetables and fruit and nut trees. As interns in 2007-2008 at Michael Fields Agricultural Institute in East Troy, Wisconsin, they learned the fundamentals of small-scale, sustainable, organic farming. They acquired their first Oberhasli dairy goats in 2009 and began making cheese and goat’s milk soap. 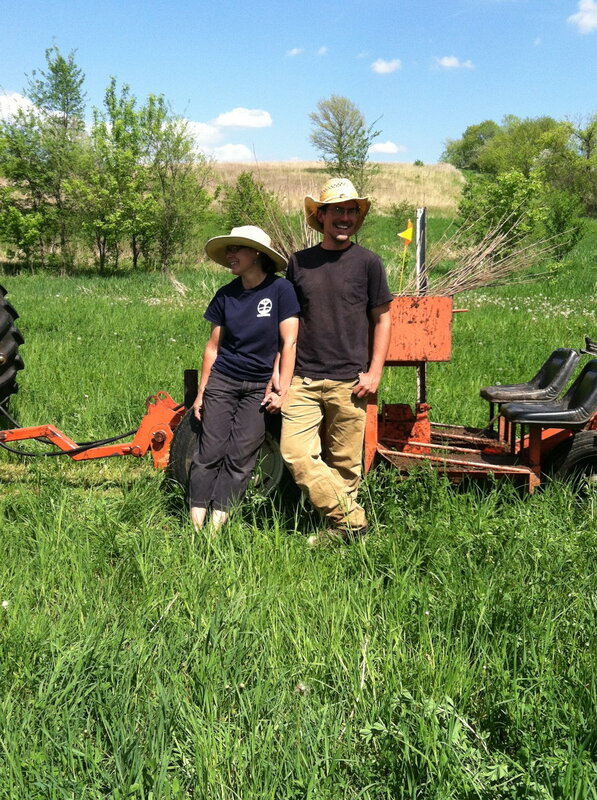 They continued working with and managing other small-scale organic farms including Prairie Dock, LotFotL, Turtle Creek Gardens, and Rohrganics, and further developed interests in growing shiitake mushrooms, fruit and nut trees, as well as a diversity of other perennials, and soil-building with cover crops. In 2014, they started a chestnut orchard at Feral Farm in southern Wisconsin and eventually would like to trial various nut trees on Washington Island. In a spirit of partnership with The Hotel Washington and Hoot Blossom Farm, Folk Tree Farm happily grows vegetables and fruit for the Hotel and sells at the Gathering Ground Farmers Market.